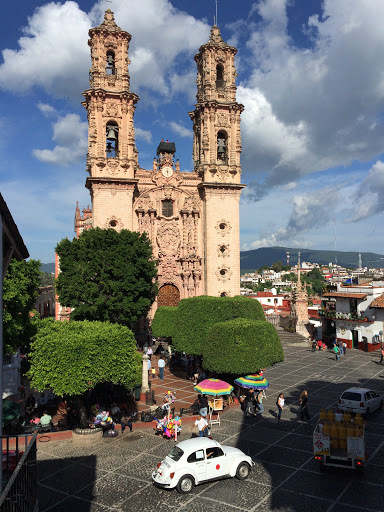 I enjoyed another beautiful day in Mexico today. 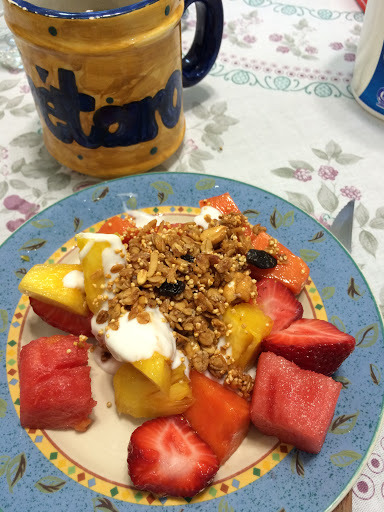 The day started with a delicious fruit salad topped with plain yogurt and granola. The salad included watermelon, papaya, mango, pineapple and strawberry. 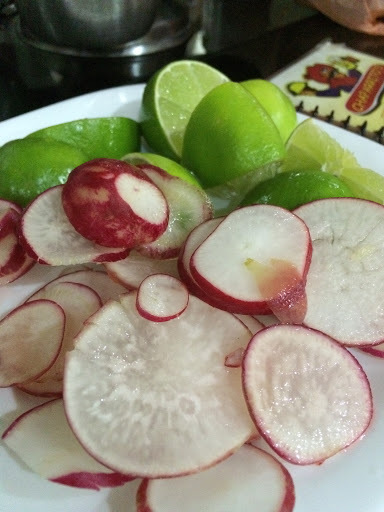 Fresh and healthy! 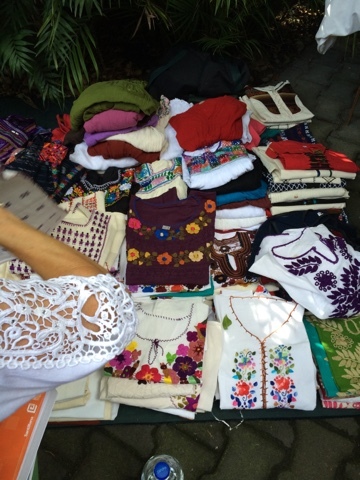 At school today, there were artisans selling their beautiful crafts and clothing. I didn’t have time to buy anything which is upsetting because today was my last chance to see them! Oh well, I guess I will have to come back another year! This is one of my teachers. Today, she demonstrated a teaching method to us where the teacher uses objects and classical music to introduce new vocabulary. 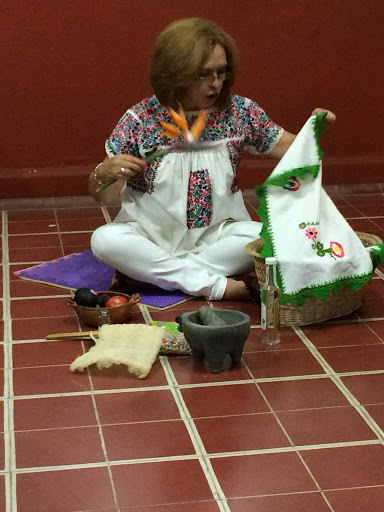 It was fun to learn a little Nahautl (an indigenous language in Mexico) in the process. This really helped me to think about what it must feel like to be a student in a foreign language classroom today! I hope to incorporate this methodology in my classes this fall! 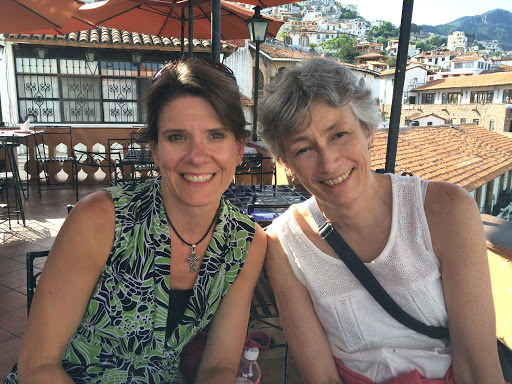 The afternoon was spent on an excursion to the city of Taxco which is in the Mexican state of Guerrero. 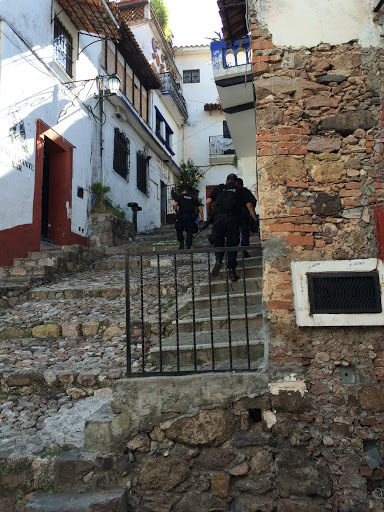 Guerrero is considered to be one of the most violent states in Mexico right now. US citizens are being advised to avoid it due to the high number of murders and kidnappings. 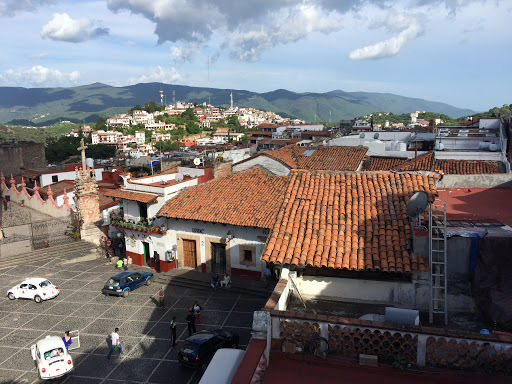 Unfortunately, Guerrero happens to be where one of the moist quaint colonial towns in Mexico is located. 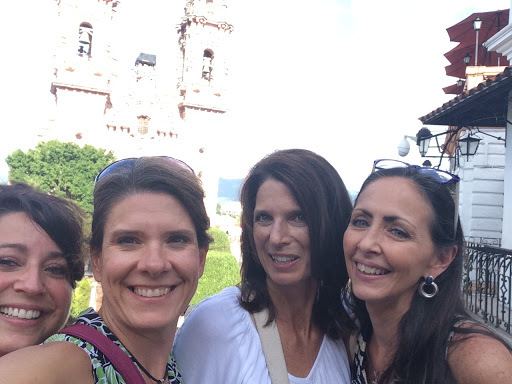 It is the silver mining town known as Taxco and it is precious! I was there in 1991 and remember it as one of the prettiest places I’d ever seen. 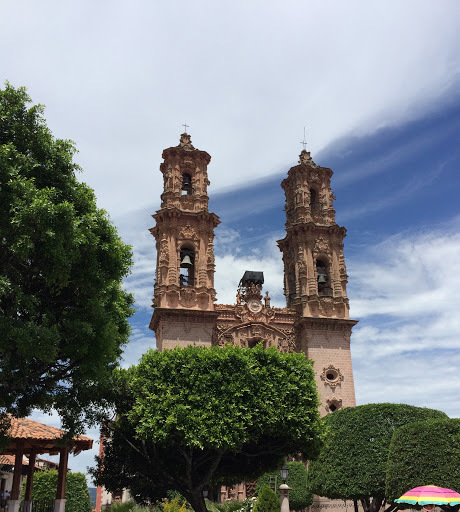 The gorgeous Santa Prisca Church is the centerpiece around which the town is built. The streets are windy and small (even curvier and narrower than San Francisco). It is a jewelry collector’s paradise. Store after store of silver pieces line the sidewalks. Most of my friends found gifts and personal items, but I preferred to observe. I just didn’t see anything that I couldn’t live without. It was fun just to be there. 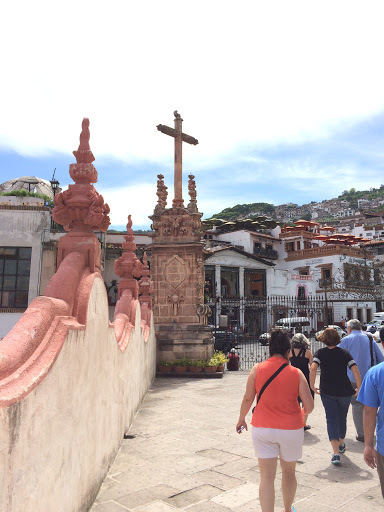 Taxco is surrounded by the Sierra Madre mountain range and resembles a beautiful Italian or Grecian hillside community. 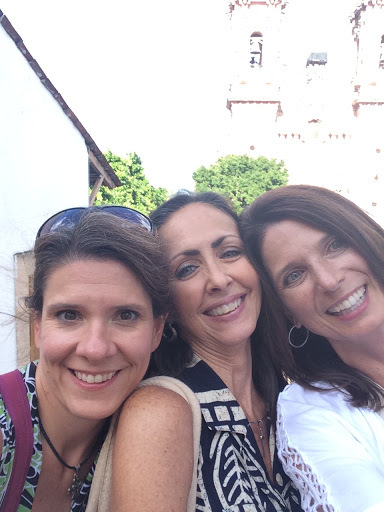 Just like in Cuernavaca, we seemed to be the only US tourists there. 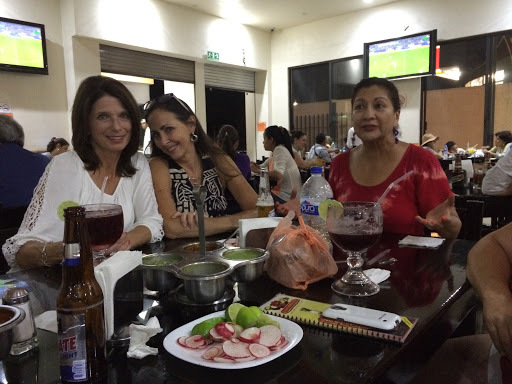 We northerners are terrified of Mexico and it has really hurt the economy that so few of us are visiting. 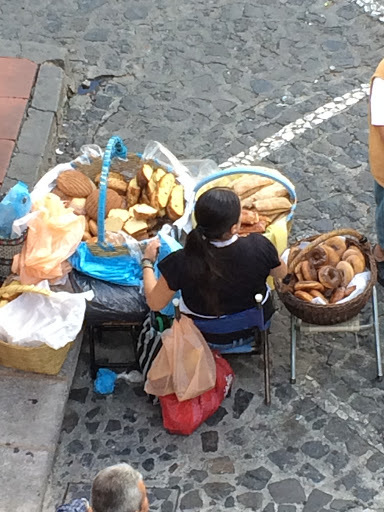 The shop owners and street vendors were desperate for our business. They would grab us on the street, follow us from store to store and even try and bribe us with free Mezcal shots and cold bottles of beer. In addition to the persistent shop owners, we were also followed by one man in particular who seemed to be escorting us from store to store. He kept reminding us that we had 2 hours to shop and that he knew where our van was parked. We were never introduced to this man and he wasn’t part of our group. We just assumed he was a store owner who also happened to be a friend of our tour guide or driver. 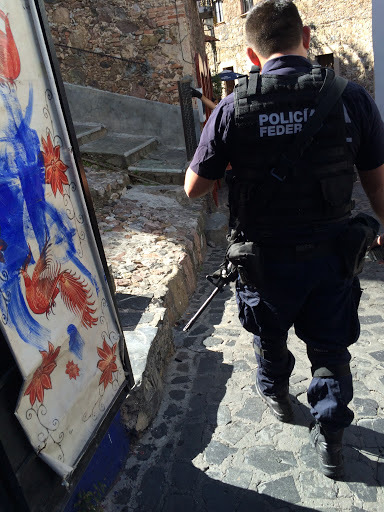 At one point, my friend and I realized that there were 3 Policia Federal agents who always seemed to be right where we were shopping. After the third or fourth store, we started to believe that they were following us. After a few more shops, we we confident that they were staying close to us. Whether they were watching us to make sure we didn’t steal anything or watching us to protect us is up for debate. However, at the end of our visit, we did observe our tour guide giving cash to man who first escorted us from store to store. 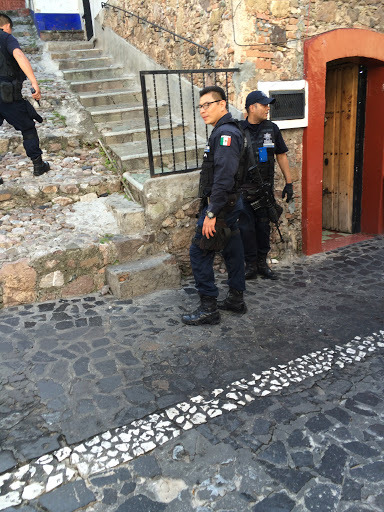 After analyzing this for a few hours, I truly believe that this “man” was a local man who was paid by our tour guide to enlist the help of the police to follow us and keep us safe while in the town. It was just plain strange! 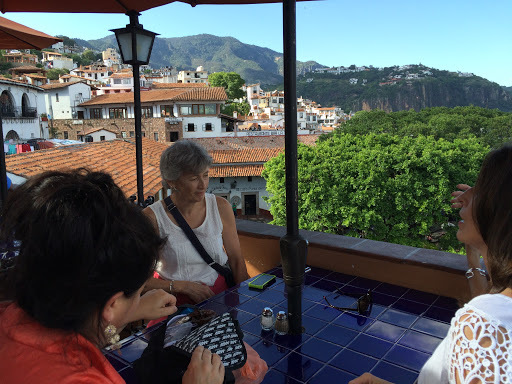 At the end of our time in Taxco, we happened upon a little restaurant with an upstairs balcony. 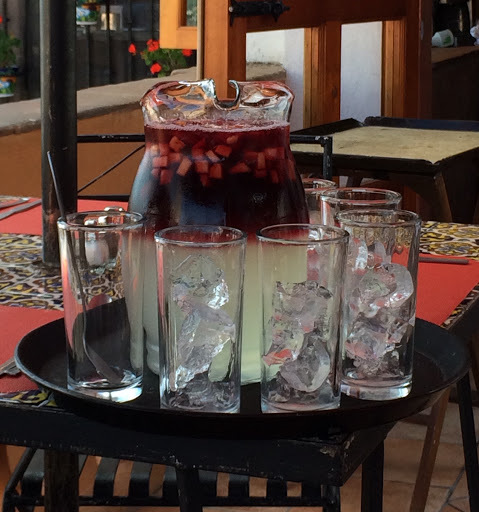 We ordered a pitcher of clericot and shared a toast to the little town of Taxco. With all of its apparent problems, it is still a neat place to visit. We took some selfies and I also had a photo taken of me with my new “sole” sister. 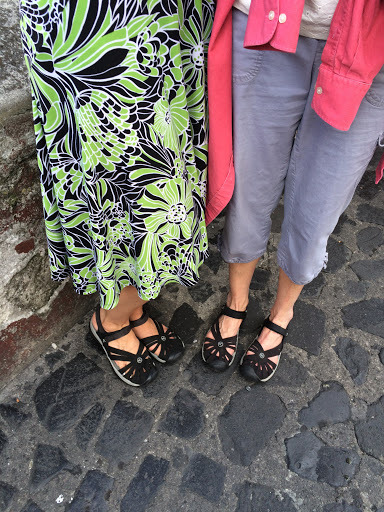 We both have the same Keen shoes which is crazy because they aren’t sold in many stores. They are the best shoes for trips like this! 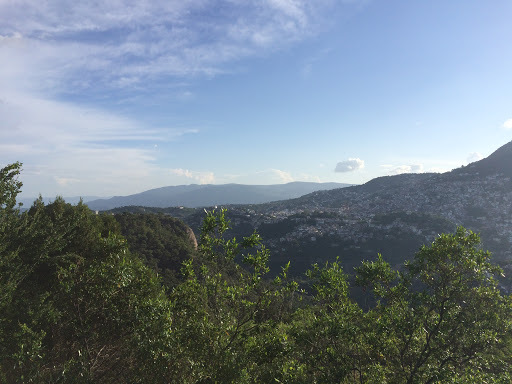 We journeyed back through the mountains toward Cuernavaca. We arrived home around 8pm and were starving. 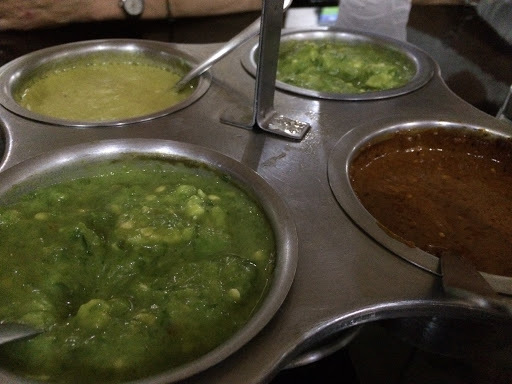 We walked to a taqueria where I had a simple vegetable and cheese plate that included avocado and nopales (cactus leaves). 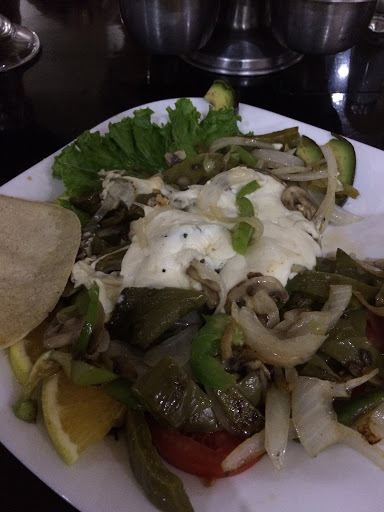 It hit the spot! 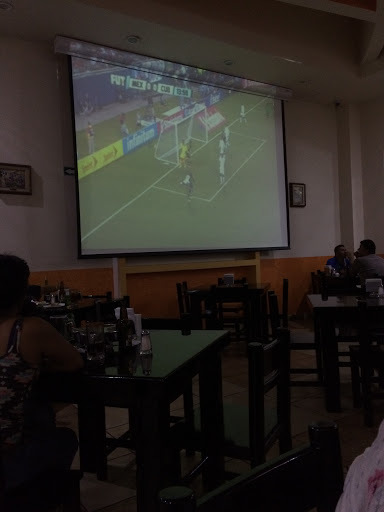 We also watched a little of the Mexico-Cuba soccer game! Tomorrow is my last day at school and I have two presentations to prepare. I can’t believe how quickly these two weeks have passed! 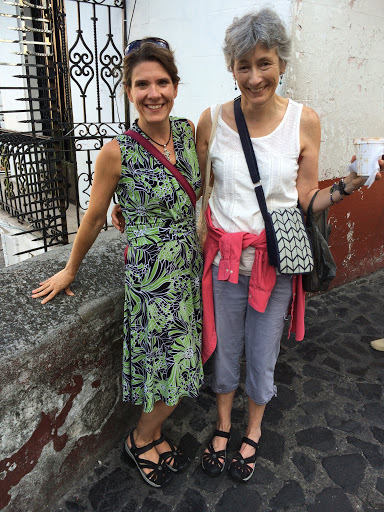 I’m looking forward to the weekend when Brian arrives, but I am sad to be leaving Cuernavaca.